Mike Sorrentino of The Jersey Shore — aka The Situation — has checked into rehab, his rep sort of confirmed. What drove the reality star into treatment? The Jersey Shore star Mike Sorrentino has a situation — and he is hiding out in an “undisclosed location” that some say is rehab. 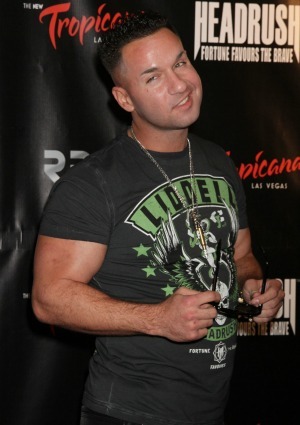 Sources say that The Situation is currently in treatment for substance abuse problems — not surprising considering the guy makes a living through partying for the cameras and club-hopping for paychecks. However, his rep kind of danced around the issue when asked for a confirmation. While stating that Sorrentino is not seeking help for substance abuse problems, there are lots of other reasons someone can go into treatment — and the rep’s carefully worded statement left the door wide open for any and all of those. The Situation himself even chimed in. “Don’t believe everything you read or hear,” Sorrentino tweeted, which might be the most compelling denial — most facilities will not allow patients access to the internet. Maybe he just needed a break from Snooki? After all, those pregnancy hormones can make even the sweetest guidette turn into a monster.